Are you a survivalist who only takes one item? You need this 12" Elite Forces Bowie. 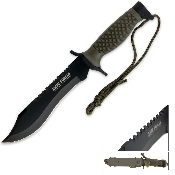 The 7 1/2" black anodized stainless steel blade will cut through anything. Strap it to your leg with the included ABS sheath and you're ready for action. Includes lanyard cord.